Wine Tasting/Buffet: This autumn event, originated in 2016, has proved very popular. Club members, their families, and the general public are invited for an evening of wine, food, and conversation. About 70% of our members attended this year; in addition to good fellowship, the function also serves to raise extra funds for our Arlington Rotary Education Foundation which provides scholarships for local high school students. Regular Meetings as Family Events: Each year on three special occasions (Christmastime, Easter season, and the installation of new club officers in June) our regular meetings are held as special events to include members’ families, with a special menu, a brief program, and a more festive atmosphere. These events usually draw about 60-75% participation by members, about half of whom also bring family members. Theater Night: Each spring we plan an off-site gathering for dinner and attending a play at a regional theater; this year’s event involved about 20 members. Fireside Chats: Another club tradition is Fireside Chats (informal meetings of small groups of members and families, held in members’ homes). These were held in February this year with about half the membership and their partners attending. Pending members are also included, if they want to attend. Newer members in particular have found these informal sessions a great way to get to know other Rotarians. Workplace Visits: Our first regular meeting of each calendar year is reserved for off-site meetings in which two or three members host the others for visits to their place of work. These meetings expand our knowledge of one another’s professions and provide another occasion for informal camaraderie. We work to provide a network of support that includes members, families, and former members. Our club directory has an “Old Friends” section with contact information on members who have left the club because of transfer or retirement, so members can maintain ties. Often these former members return to visit us for a meeting, and one former member is now rejoining the club. The club marks special events (such as a promotion, the birth of a child or grandchild, or the achievement of another year of perfect attendance). Also, in recent years, several valued older members have died; the club worked hard to provide support to the family, in one case canceled our regular meeting so members could attend services, and has maintained contact with their families, who often attend our special or regular meetings. New members are assigned a mentor, and encouraged to join a committee and “get involved” rapidly; each new member gives a classification talk about his/her life and profession. All of our club’s service projects are conducted with fellowship in mind. Whether it’s manning the Salvation Army kettle, assisting with community blood drives, participating in the DC Help the Homeless Walk, or assisting Arlington Healthy Families to hold their summer and winter social events for their clients, we always seek to have two or more Rotarians working together, or gather a team to participate. We’ve found that members look forward just as much to the opportunity to develop a deeper relationship with their peers as they do to the opportunity to serve the community. The main club administration duties such as producing the club Bulletin and setting up for meetings are shared by all members on a rotating basis. New members in particular are asked to serve for a month, shortly after their induction, as greeters to help them meet (and be met by) all members. Regular meetings feature a mix of fun activities, including a 50/50 and “Happy Talk,” both of which incidentally also help to fund our scholarships. We conduct an active program of longer-term members helping newer or younger members to complete their PH status. This “helping hand” attitude helps create a bond of shared responsibility. Keeping in mind the Family of Rotary, several members have also used their contributions to honor their spouses with Paul Harris Fellowships. Like most clubs we have a weekly printed bulletin, The Arclight. However this year we expanded our efforts to keep members informed of and involved in our activities by having service directors and committee chairs make short scheduled presentations on activities in their areas or in some cases (like GSE) the presentation was the full program of a meeting. Fireside Chats usually have a designated Rotary topic for discussion. Our revitalized website offers information for members but has also been helpful in bringing several new members into the club. Arlington Rotary was one of the first clubs in the area to publish an informational brochure for prospective members and the public at large. 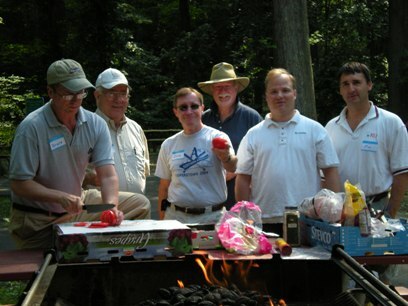 Bruce, Carl, Steve, Hugh, Jeff and Jim help prepare the food for the Healthy Families Picnic.